Are these elegant animals a symbol of bad luck? Or do they actually bring good fortune? 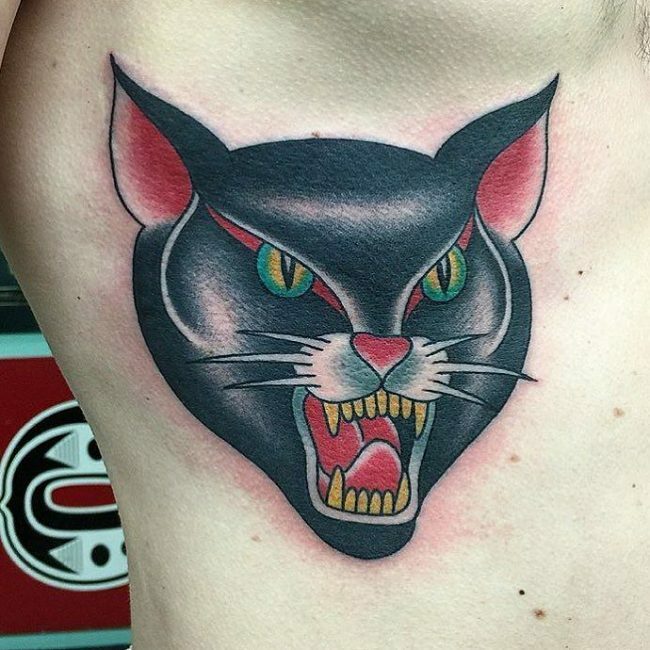 And why do people choose to have a black cat tattoo? Let’s start by finding out a little about society’s history with cats, particularly the black ones. They’ve been worshiped by some and persecuted by others, but cats have remained close to humans for thousands of years. Egyptians loved them so much that they called them “caute” which means favorite pet. Black cats were worshiped in Egypt because they were believed to have been an extension of the cat goddess Bast and killing them was considered a crime that was punishable by death. In ancient Roman times, it was advantageous to have a house cat, they were believed to bring good fortune and grant domestic peace within the residence. But then came the Middle Ages. In this time there was much religious persecution and people confused pagan practices with devil worship. The fanatics of this time viewed black cats as messengers of the Devil and this is when all the superstition around black cats began. It is believed thousands of cats were killed due to this propaganda, simply because of the color of their fur. When we look at the nature of cats we can see why our ancestors may have feared them, especially when they appeared with pitch black fur and bright yellow eyes. 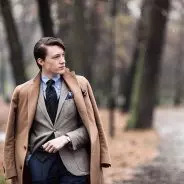 They embody the definition of “free spirit”, coming and going as they please; fiercely independent and often aloof. They are mysterious creatures which may love us today and ignore us tomorrow. It is probably this puzzling behavior that caused people to fear them; because they couldn’t understand them. Even after thousands of years we still do not understand cats and because of this many people associate their strange mannerisms with the supernatural, with some people even believing that they are inter-dimensional shapeshifters. 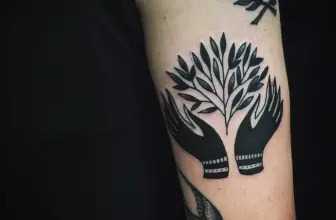 People who choose this tattoo may do so to represent their love of the unexplained or they may see themselves as a mysterious person. Cats have been linked to the moon goddess Diana in pagan beliefs and this may be the reason that black cats in particular as viewed as a symbol of spirituality as well as femininity. If you have ever owned a cat you will know that they are free spirits who live to please themselves and don’t tolerate anything that displeases them. They come and go as they like and hate to be contained in any way. 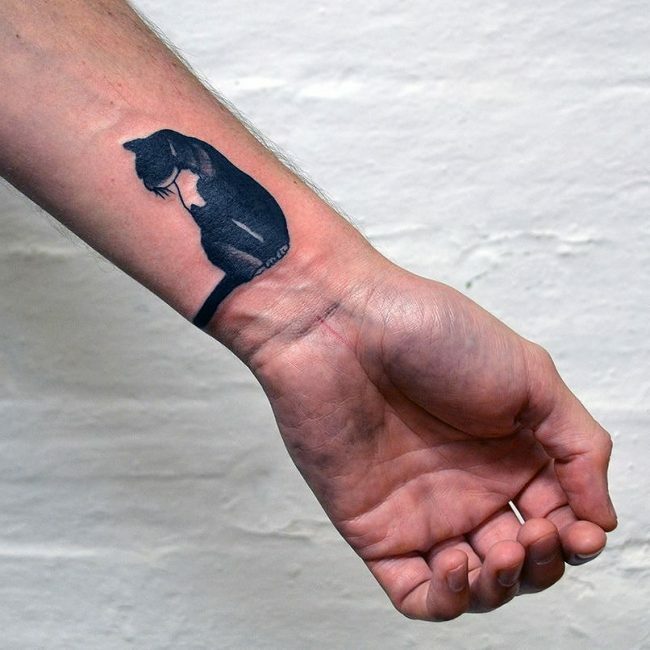 For many people getting a black cat tattoo is a representation of their own independence and their struggle for freedom. In the Middle Ages people misunderstood Wiccans and pagans, but today these practices are perfectly acceptable in most societies. Getting a black cat tattoo could show your admiration or interest in these ancient religions. In recent times there have been many campaigns (started by cat lovers) that aim to break the bad luck symbolism associated with black cats. The reason that they do this is because thousands of black cats are abandoned and abused every year as some people still associate them with evil. The result of these campaigns is that the black cat is starting to become associated with good luck instead. One of the reasons that cats have remained alongside humans is due to their hunting skills. Cats catch mice, rats, and other vermin, thus helping humans to avoid disease. This is probably why the Romans were keen to have them around and saw them as an omen of good fortune. Today a person may choose to include a black cat in their tattoo design as a totem of protection from harm. Big eyed cats playing with balls of wool make a cute girly tattoo and even doodle style black cats are quite popular. These designs usually show a cat with a puffed upright tail, evil eyes and sharp teeth. Usually, they are made in “old school” technic. Cats have long been associated with witches and it’s common to find them riding a broomstick along with a witch in a tattoo design. Because of their association with the moon goddess a fashionable design shows a large crescent moon with a cat sitting below. Flash art tattoos (generic designs found on the walls of a tattoo parlor) often depict cats in silhouettes in a variety of poses from sitting to running and even “sliding” down. 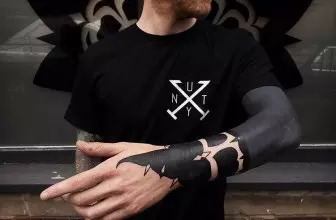 A black cat with an arched back is commonly associated with the Anarchism and those who have this political preference may choose to have a tattoo with this image to represent their allegiances and beliefs. These designs are highly detailed and often show the face of a black cat. 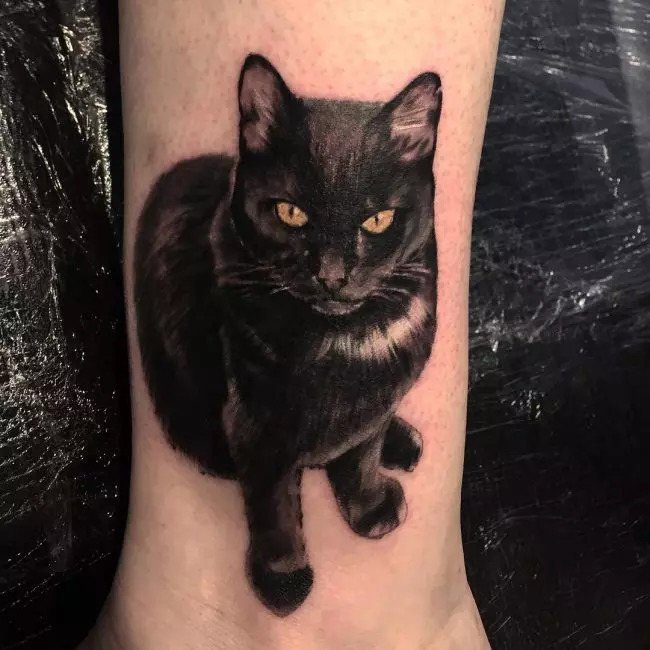 Black cats make beautiful subjects for watercolor style tattoos where the artist will use a variety of black and gray inks. Tiny silhouettes and cartoon cats can be placed just about anywhere on the body. Women prefer this type of tattoo on their wrists or feet. Larger designs like the crescent moon or a witch and black cat scene need more space so that the artist can add more detail and these often appear on the shoulders or back. This kind of tattoo is extremely versatile and can look good on any area of the body. Black cats have had a tough time, but as more people learn that they have nothing to fear from them this is starting to change. 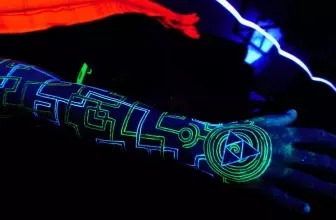 A person who wears this kind of tattoo could be a person who appreciates the mystery, elegance and intelligence associated with them or they could be a person who associates them with religion or spirituality. 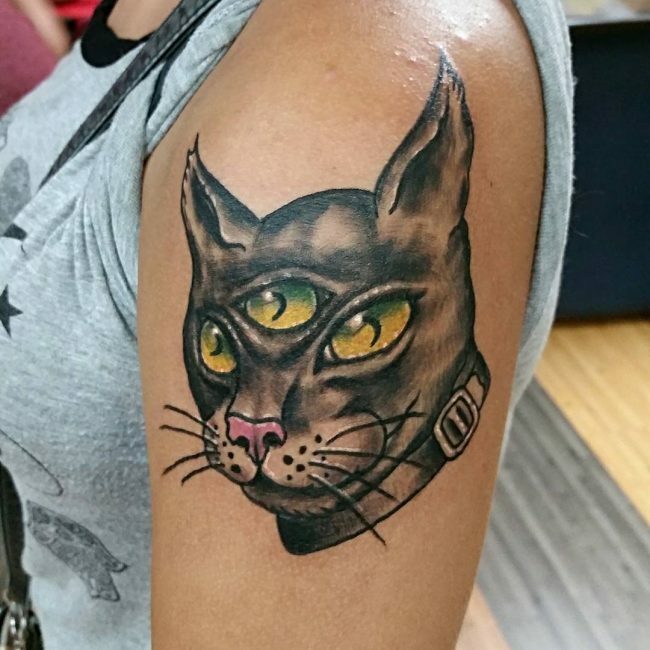 If you love cats and have a special place in your heart for the black fur ones, then a black cat tattoo could definitely suit you!